A couple of years ago, Todd, Diane and I flew to NYC to work on a small video project with the French Culinary Institute. We met up at the hotel on the first day and after a 14.63 second hello, we jumped into a cab and headed to Momofuku Saäm Bar. If you know us, food is on our minds – ALL THE TIME. We’d rather stay in a clean hotel in the crappy part of town to save money — so that we could spend it on food…..which we did. Our hotel….err….motel was nice, tidy but sooo small. If I wanted to stretch out my arms, I’d have to open the door to so. And I’d probably even hit the elevator button in the same motion. But enough about the hotel, back to the food. At Momofuku Milk Bar, we saw little jars of Kimchi Butter for sale (see DL’s mention and photo of the jar), and I was so tempted to buy a gallon to bring home with me, but I don’t think TSA would appreciate a vat of butter in my carry on. 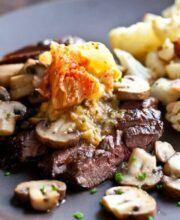 Kimchi butter is spicy, savory, a touch of sour and is awwwwwesome on steak, burgers, vegetables or eggs. Psssstttt…..great hangover breakfast: scrambled eggs cooked with kimchi butter and a side of bacon. Here’s my version that includes chopped kimchi, a spoonful of miso (for savory) and some good butter. Other things you can add to make your own – a few shakes of fish sauce, finely minced garlic, finely grated fresh ginger and Korean chili powder to make it more spicy. Add everything to your food processor and whiz, whirl until everything has come together nicely. Or, if you like, just chop everything by hand and mix in a bowl. You can put this in a jar and refrigerate, but I like to make Kimchi Butter logs that I can refrigerate or freeze. When I need some, I just cut off a piece of the log and return the rest to the freezer. I use a sushi mat to make rolling a lot easier, but you really don’t need to if you don’t have one. 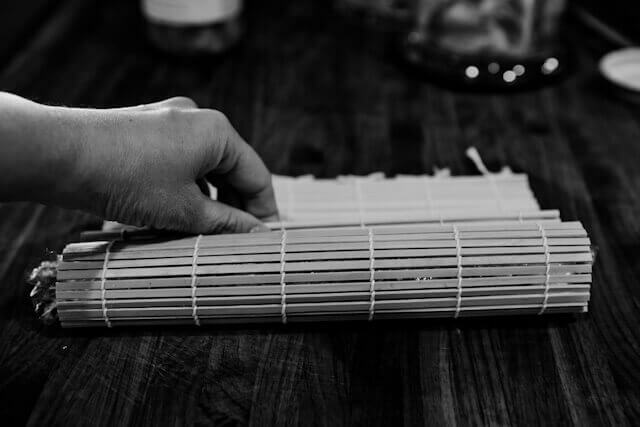 Lay the sushi mat on the counter with the slats going horizontal. Lay a large piece of plastic wrap on top. 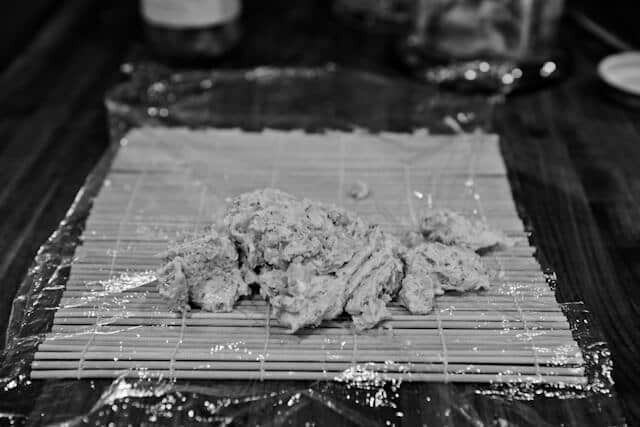 Spoon the Kimchi Butter onto the plastic wrap. 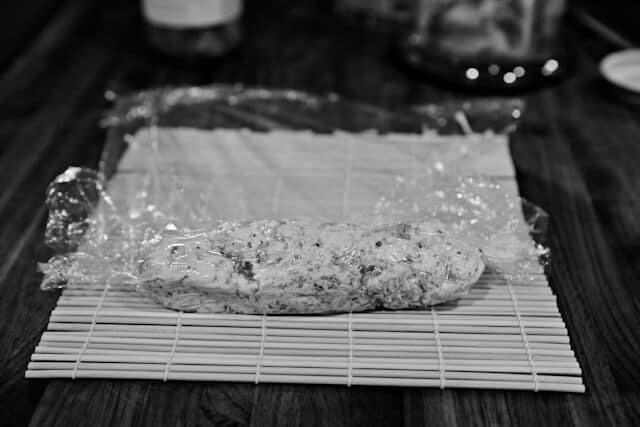 Wrap the bottom edge of the plastic wrap up and over and shape loosely into a log shape. 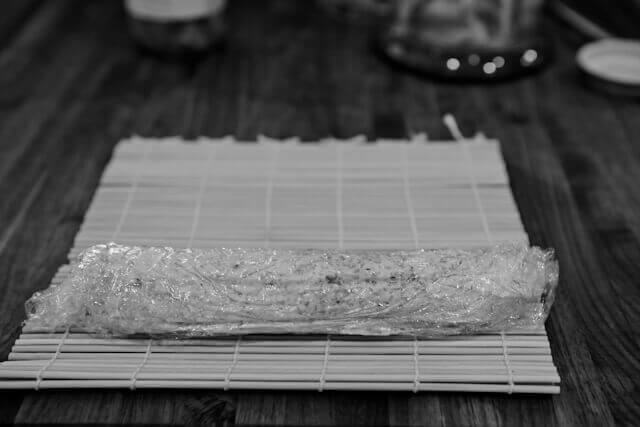 Try to keep a 1.5″ edge of plastic wrap on both sides. Grab the bottom of the sushi mat and roll on top of the log. Ta-da! Twist the ends and refrigerate or freeze. Or you could just skip all this fancy rolling and place the Kimchi Butter in a jar or plastic tub to refrigerate. 1. 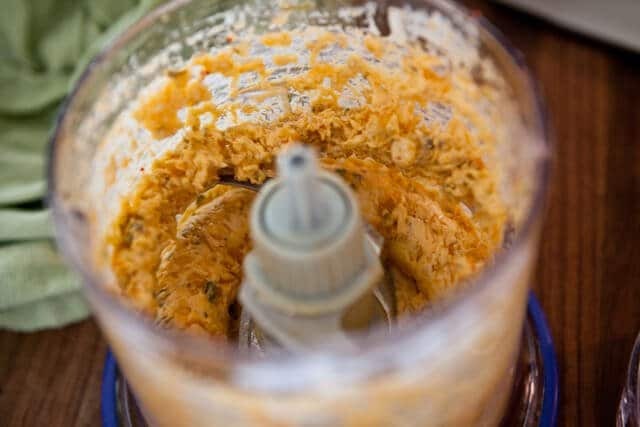 To make the Kimchi Butter - combine the kimchi, miso paste and butter (you can chop the kimchi by hand or add everything in a food processor give it a good whiz). Store Kimchi Butter in a jar or make a log (see photos above). 2. Preheat a large grill pan and grill the steaks to your liking. For 1" steaks medium-rare, I like to grill each side for 5 minutes on high heat. Then turn the heat to low, cover steaks loosely with tin foil and let finish cooking for an additional 3 minutes. 3. Remove the steaks to a plate to let rest. Return the same pan to the stove and turn heat to medium-high. Add 2 tablespoons of Kimchi Butter to the pan. When the butter is bubbling, add in the sliced mushrooms and cook for 5-7 minutes until tender. Stir in the soy sauce and the fresh chives. 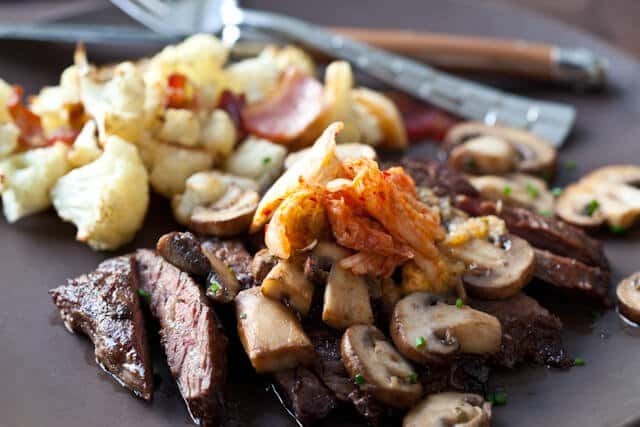 Serve mushrooms on top of the steaks with a side of kimchi. Starting out at fermenting, this will be the first recipe I try with my home made kimchi. Steak is my favorite. Love the sound of kimchi butter and I have a freshly made batch of kimchi in the fridge right now! Oh yes! I found my lunch for Sunday. This looks awesome. What kind of kimchi are you using in your butter? I ask because there’s sooo many different kinds of kimchi and I cant imagine all of them would be good on a steak. Perhaps you should adjust your directions on the recipe. Instead of combine all the ingredients, combine everything but the optional kim chee garnish and steak. some of the previous comments seemed confused. Hi Ann, thanks for letting us know! We have adjusted it now so hopefully it’s more clear. Can anyone suggest where i might be able to buy a jar of kimchi butter? This definitely seems like a creative take on steak! Licking my lips just looking at the pics. wow! You had opened my eyes! You can actually find little bottles of kimchi in the veggie section right where they have tofu and bean sprouts…if not, google up a korean or asian market in your area. I’m not sure which part of Florida you live in, but there are bunch of asian markets scattered in Florida. I eat kimchi with EVERYTHING. Literally. I eat it on toast, I eat it with my pasta (I even put it IN my pasta – bacon kimchi pasta is a must!! ), I eat it with my take out pizza, in my quesadilla, with my chicken wings…and of course I eat it with rice. But I’ve never thought of it IN butter!!! Ingenious!! I am soooo trying this out with my mom’s homemade kimchi!!! as a bi-racial military brat who grew up in Japan and had Korean neighbors on one side and Hawaiian on the other, I got my fair share of trying different foods and kimchi was always a favorite (even though I was only about 12 Years old). I’m so glad I live near a HUGE Asian market and can’t wait to try this at my dads house!!! YUMMO! ooh! 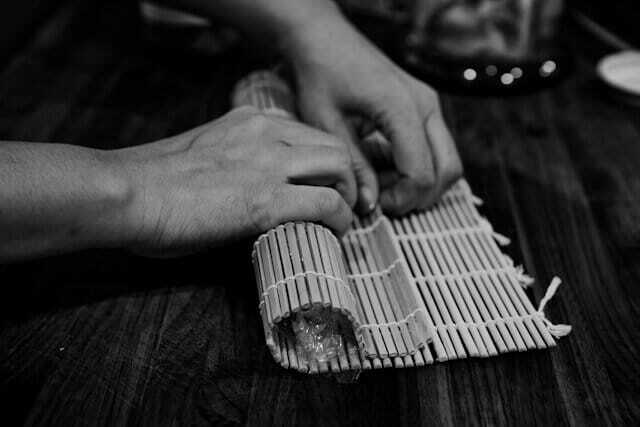 the sushi mat rolling is such a good idea for rolling compound butter to nice logs! never tried kimchi butter but it sounds delish!!!! I love this recipe already. Just wondering where to get Kimchie and Miso Paste. Couldn’t find in local Publix grocery store. Well of COURSE I love this. You’ve inspired my grill with this one. Recipe for scratch Kim Chi PLEASE!!!!!!!!! This is a new recipe! It’s great to know. Thank you! Thank you soo much for this recipe. I’m excited to try it this weekend when my children and there families visit. 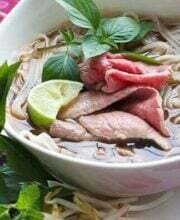 It looks very delicious! I can hear angels singing in the background. This dish really looks heavenly! I love kimchi… All kinds of kimchi… When I have a jar, I practically eat it with everything, cooking it in fried rice, adding it to scrambled eggs, tossing itin some ground beef, anything. This kimchi butter looks very delightful. I love it and can’t wait to try it! Whoa…how have I never heard of kimchi butter before? That sounds absolutely delicious. I can’t wait to try it. I’m so glad I found your blog! Looks and sounds “scrumdillyious”! Also, what’s the shelf life for kimichi ??? That’s a new concept of Kimchi. I have never made kimchi and to be honest I’m not quite sure I know what it is…Your dish looks awesome! 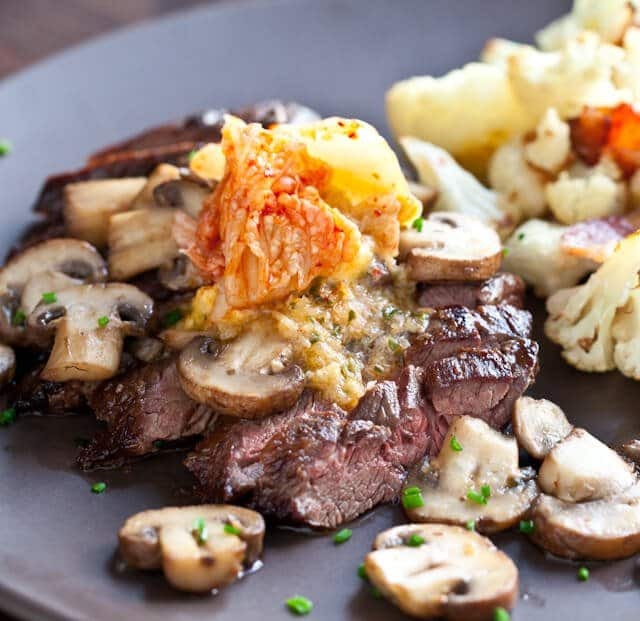 The steak looks like it is cooked just right and the cauliflower in the background had my interest peaked too. Looks great…and looks like I need to learn how to make kimchi! I want the steak and the wonderful butter! Mmmmm I love anything with kimchi on but kimchi butter sounds like heaven! !